​Math is everywhere you look. Everyday Mathematics is distinguished by its focus on real-life problem solving, balance between whole-class and self-directed learning, emphasis on communication, facilitation of school-family cooperation, and appropriate use of technology. Everyday Mathematics provides numerous methods for basic skills practice and review. These include mental math routines, practice with fact triangles (flash cards of fact families), daily sets of review problems called Math Boxes, homework, timed tests and a wide variety of math games. Throughout the Everyday Mathematics curriculum students are encouraged to explain and discuss their mathematical thinking, in their own words. Opportunities to verbalize their thoughts and strategies give children the chance to clarify their thinking and gain insights from others. Everyday Mathematics teaches students how to use technology appropriately. The curriculum includes many activities in which learning is extended and enhanced through the use of calculators. At the same time, all activities intended to reinforce basic computation skills are clearly marked with a "no calculator" sign. In addition, students are encouraged to use the Online games in the computer lab and at home. Unit 1-12 Everyday Math Study Guides available below. Please scroll down. 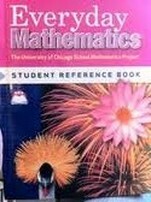 Click on the link above to access Everyday Math games and Student Reference Book from home. Student login looks like this. Your child will use this book in class to research new math concepts, vocabulary, different strategies (algorithms) to solve problems, rules for games, and examples of how to solve problems. This book can be accessed Online through your child's login. Click on links below to print Unit Study Guides.